خسروی, نیکو, کردی, محمدرضا, اسدی, فهیمه. (1394). تأثیر هشت هفته تمرین استقامتی بر بیان ژن NT4/5 در عضلات تند و کند انقباض موش های صحرایی نر ویستار. 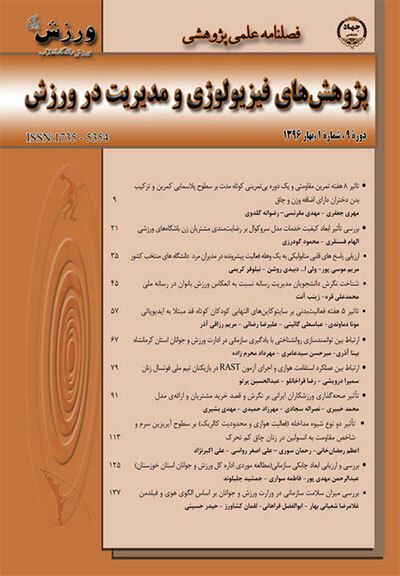 پژوهش های فیزیولوژی و مدیریت در ورزش, 7(2), 47-55. نیکو خسروی; محمدرضا کردی; فهیمه اسدی. "تأثیر هشت هفته تمرین استقامتی بر بیان ژن NT4/5 در عضلات تند و کند انقباض موش های صحرایی نر ویستار". پژوهش های فیزیولوژی و مدیریت در ورزش, 7, 2, 1394, 47-55. خسروی, نیکو, کردی, محمدرضا, اسدی, فهیمه. (1394). 'تأثیر هشت هفته تمرین استقامتی بر بیان ژن NT4/5 در عضلات تند و کند انقباض موش های صحرایی نر ویستار', پژوهش های فیزیولوژی و مدیریت در ورزش, 7(2), pp. 47-55. خسروی, نیکو, کردی, محمدرضا, اسدی, فهیمه. تأثیر هشت هفته تمرین استقامتی بر بیان ژن NT4/5 در عضلات تند و کند انقباض موش های صحرایی نر ویستار. پژوهش های فیزیولوژی و مدیریت در ورزش, 1394; 7(2): 47-55. هدف از پژوهش حاضر، مطالعه تاثیر هشت هفته تمرین استقامتی(پنج روز در هفته) بر بیان ژن پروتئین NT4/5 در عضلات کند انقباض (نعلی) و تند انقباض (EDL) موش­های صحرایی بود. بدین منظور تعداد 14 سر موش نر ویستار با دامنه سنی 50 تا 60 روز و میانگین وزنی 10± 160گرم به طور تصادفی به دو گروه تجربی (7n=) و گروه کنترل(7n=) تقسیم شدند. دویدن با سرعت 25 متر در دقیقه به مدت 50 دقیقه بر روی تردمیل به عنوان تمرین استقامتی در نظر گرفته شد. برنامه تمرین به مدت هشت هفته و در هر هفته پنج روز اجرا شد. 24 ساعت پس ازآخرین جلسه برنامه تمرین استقامتی و 8 ساعت ناشتایی، آزمودنی­ها بیهوش شدند و عضله نعلی و بازکننده دراز انگشت شست پای آنها تحت شرایط استریل جدا شد.بافت­های مورد نظرپس از وزن شدن، دردمای 70- نگهداری شدند.به منظور اندازه­گیری میزان بیان ژن NT4/5 ازروش RT-PCR استفاده گردید.همچنین برای تجزیه وتحلیل داده ها ازروش های آمارتوصیفی وآزمون تحلیل واریانس ANOVA دوطرفه (در سطح معناداری 05/0) استفاده شد.یافته های حاصل ازپژوهش نشان داد که هشت هفته فعالیت استقامتی باعث افزایش در بیان ژن NT4/5 در دوعضله کند انقباض نعلی وتند انقباض EDL شدکه این افزایش درعضله تندانقباض EDL بیشتراز عضله کندانقباض نعلی بودولی ازنظرآماری اختلاف معناداری بدست نیامد. لذابه نظر می­رسد بررسی تأثیرتمرینات استقامتی باشدت و مدت بیشتر تمرین می­تواند به عنوان محورهای پژوهشی آتی درنظرگرفته شود. This study aimed at investigating the effect of 8 weeks of endurance training (5 days a week) on NT4/5 protein gene expression in slow twitch (soleus) and fast twitch (EDL) muscles of male Wistar rats. 14 male Wistar rats (age range 50-60 days old, mean weight 160 ± 10 g) were randomly divided into two groups (experimental and control; N=7 for each group). The training protocol consisted of running on a treadmill with 25 m/min for 50 min. for 8 weeks, 5 days per week. After 8 hours of fasting and 24 hours after the last session of endurance training, rats were anesthetized and their soleus and extensor digitorum longus (EDL) muscles were removed under sterile conditions. The mentioned tissues were homogenized and kept in -70̊ C after weighing. RT-PCR method was used to measure the NT4/5 gene expression. Data were analyzed using descriptive statistics and two-way ANOVA (significance level ≤ 0.05). The results showed that 8 weeks of endurance training increased NT4/5 gene expression in soleus and EDL muscles. This increase was greater in EDL while there were no statistically significant differences. It seems that further research is needed to examine the effect of endurance training with more intensity and duration. 1.Barde Y A (1989).Ttophic factors and neural survival .Neuron; 2:1525-1534. 2.Barker P A, Shooter E M(1994). Disruption of NGF binding to the low-affinity neurotrophin receptor p75 reduces NGF binding to TrKA on PC12 cells. Neuron; 13:203-215. 3.Bradely c. Gill,Brain M. Balog(2013). Neurotrophin therapy improves recovery of the neuromuscular continence mechanism following simulated birth injury in rats. Neurourology and Urodynamics , 32, pp. 82–87. 4.Carrasco DI, and English A W(2003). Neurotrophin-4/5 is required for the normal development of the slow muscle fiber phenotype in the rat soleus. J Exp Biol 206, 2191-2200. 6.Deschenes, M. R. (2000). Effects of resistance training on neuromuscular junction morphology. Muscle Nerve 23 , 1576-1581. 7.Friedman B, Kleinfeld D, Ip N.Y, Verge V.M.K, Moulton R, Boland P, Zlotchenko E, Lindsay R.M, Liu L(1995). BDNF and NT4/5 exert neurotrophic influences on injured adult spinal motor neurons .J. Neurosci. 151044-1056. 10.Hempstead BL, et al(2006).Dissecting the diverse action of pro- and mature neurotrophins. Curr Alzheimer Res; 3 (1):19-24. 12.Ibanez C F, Ebental T, Persson H(1991). Chimeric molecules with multiple neurotrophic activities reveal structural elements determining the specificities of NGF and BDNF . EMBO J,10:2105-2110. 4., and Evefts, M. E. (2007). Treadmill but not wheel running improves fatigue resistance of isolated extensor digitorLul longus muscle in mice. Acta Physi ol (Oxf) 190, 151-161. J., and Skup, M. (2007). Locomotol exercise alters expression of plo-brain-derived neurotrophic factor, brain-derived neurotrophic factor and its receptor TrkB in the spinal cord of adult rats. Eur J Neurosci 25, 2425-2444. 15.Mohammadkhani R (2001).Effect of one session of resistance exercise on NT4/5 proteins in slow and fast muscles of wistar rats. Thesis, tarbiat modares university, Tehran. 16.Ogborn D I, Gardiner P F. (2010) . Effects of exercise and Muscle Type on BDNF, NT4/5 and TrKB Expression in skeletal muscle, Muscle nerve;41:385-391. 17.Sakuma K, Watanabe K, Sano M, Uramoto I, Nakano H, Li YJ, et al(2001). A possible role for BDNF , NT-4 and TrKB in the spinal cord and muscle of rat subjected to mechanical overload, bupivacaine injection and axotomy. Brain Res ; 907:1-19. 19.Thoenon H(1991). The changing scene of neurotrophic factor. Trends Neurosci; 14:165-170.